I had the pleasure of meeting Mikey Anderson, creator of the little 'Toxic Clouds' below, in a class at SAIC where I came to do a talk on socially and environmentally responsible business-sense for artists and designers. They are sculptures, plush toys, and a cheeky way to make a statement about environmental responsibility. Mikey emailed me after the class to let me know about his new project, and I wanted to share it with my Wunderkammer readers! These little plush clouds are made with 100 % natural fabric and felt made with plastic! They are stuffed with recycled plastic bags and bubble wrap. Plastic bags kill about 100,000 animals every year and they take 1000 years to decompose! 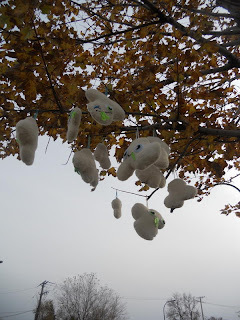 I decided to make these plush clouds in response to our poor clouds becoming 'sick' because of pollution. The fossil fuels we are burning are emitting sulfur dioxide and nitrogen oxide into the air! This shrinks icebergs, creates acid rain, depletes ozone, and even gives baby whales sunburn! So lets go green together!!!! You can snag one of Mikey's cute recycled creations by getting in touch with him through his Tumblr blog.